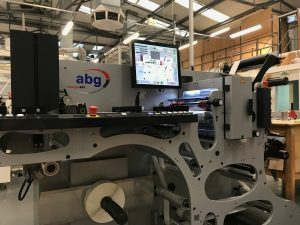 The Suffolk based label printer has installed its 2nd AB Graphic SRI Re-reeler with a Flycheck camera system for its HD Flexographic division in little over a year. 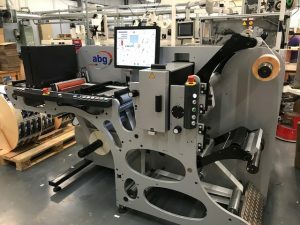 This will be the 3rd of 5 investments across the company to be completed by AbbeyLabels (Bury St Edmunds) during 2017. “We have been very impressed with the 1st SRI’s performance over the last few months. The quality & productivity of the machine has exceeded our expectations. 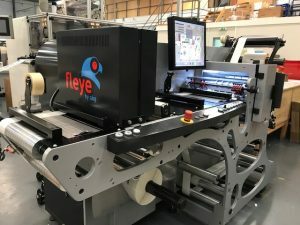 Due to the increase in demand from our customers for thinner synthetic materials and the requirement to verify every label during the finishing process, purchasing a second SRI with Flycheck was an easy decision to make “ says MD Barry Pettit . 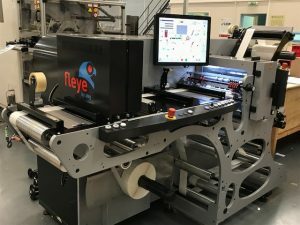 The Flycheck camera system will check and verify each label individually and if a defective or missing label is detected, the machine will slow & stop the web in the appropriate place. 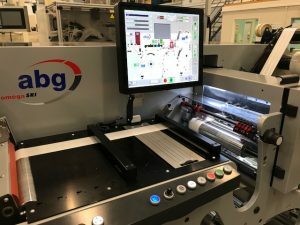 The operator can either replace or remove that label and the Flycheck system will record where on the run this has happened.